wrecks, there were plenty of people who had probably wished that it rained all weekend long. Things got started in practice on Saturday when a car lost an engine on the backstretch. Veteran Mike Rowe was heading into turn three at the time and with oil under his tires, had no control as his #24 SP2 Motorsports car hit the outside wall hard. Scott Mulkern and Alan Wilson were among the other drivers to follow Rowe into the wall. When all was said and done, everyone walked, or limped, away but Rowe’s car was basically destroyed. All of the other PASS teams will be returning to action this Sunday for the Community Pharmacies 150 at Speedway (95). Speed51.com will be on hand for the short track battle and will bring you all of the news and results from the race. their bets in case it rained again by scheduling the race for Saturday night and keeping Sunday open as a possible raindate. Speed51.com will be there as well to bring you all of the action for the Busch North opener. After several weekends of washouts, Saturday was actually decent enough in most of New England to allow some tracks to hold a little bit of racing. The IBG PASS Pro Stock series managed to cheat Mother Nature this past weekend and squeeze in their 150-lap race at Thompson Speedway (CT). Cassius Clark left the track happy, having scored his first career regular season PASS victory. Johnny Clark and Ben Rowe were right behind him at the finish and set themselves up nicely in the point standings. Corey Williams was also happy – he got his first top five PASS finish (more on that later) and Michael Ruttkamp must have been smiling after finishing tenth in only his second PASS start. The SP2 team pulled out a back-up car and got Rowe back up to speed after the wreck. He qualified fifth for Sunday’s race, but had a tire blow on lap 40 and hit the wall once again, requiring a tow back to the pits. Unfortunately, those weren’t the only wrecks of the weekend. The “Big One” actually occurred on lap 11 of the race when it appeared that the transmission locked up on the #47x car of Louie Mechalides. That sent him into a spin while other cars apparently hit some fluid on the track and also headed towards the wall. Ted Christopher took the hardest hit in a wreck that included Tracy Gordon, Mike O’Sullivan, Walt Hammond and Chuck Docherty. Hammond was the only one able to continue, while trackside observers noted that the cars of Mechalides and Christopher may both be unrepairable after the wreck. All drivers were OK, though, after the wreck. If neither car can be rebuilt, PASS may see two of their stronger partial-schedule teams sidelined for awhile. Mechalides has been a successful limited campaigner in the series over the past few seasons and the #34 team of Christopher and car owner Clinton Teague always seems to be a threat when they unload. 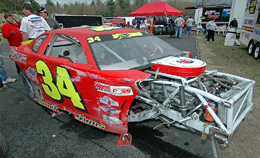 The duo won a race last summer at Thompson and had an ambitious schedule planned for 2005, including a run at the Banknorth Oxford 250 in July. After a string of rainouts in the short term, and rising property values in the long term, it appears that Waterford Speedbowl faces the possibility of turning into a housing development in the near future. An article in the Hartford Courant this past Sunday stated there have been talks between the owners of the property that the track sits on and a development group. Nothing firm has been decided or announced yet, but the writing could be on the wall. Track officials have said that the 2005 racing season, and quite possible the 2006 season and beyond, will continue and that no definite plans have been made to close the track yet. Waterford Speedbowl “remains in the business of weekly racing” and “there is no immediate plan to stop that,” said promoter Terry Eames in a statement this week. Eames acknowledged that there is a study going on involving alternative uses of the property, which is owned by 1080 Hartford Road LLC. He said he has a “fiduciary responsibility” to other stockholders in that regard but cautions the “speculation” may be premature. Meanwhile, up in New Hampshire, Star Speedway has been issued all permits to order to open their season this week. As Speed51.com told you in last week’s edition of Northern Exposure, a dispute between track management and town officials had left the facility idle so far in 2005. The track plans to kick off their season Saturday night. Nearly 100 miles Northeast of Thompson, the weather wasn’t quite as good as Sunday. No cars got torn up Sunday at Lee USA Speedway, but nobody really got the chance to wreck anything either. Moments into practice, showers came upon the track and the Whelen 150 NASCAR Busch North Series race was washed out. Click here for the full story. The race was originally scheduled for the beginning of April, but Mother Nature had other plans, so this weekend will be the ninth annual Budweiser Modified Nationals at Waterford Speedbowl. Among the entries for the two day SK Modified event will be Ted Christopher. The event pays a winner’s purse of $5,000. Saturday will feature qualifying and the 150-lap feature will take place on Sunday afternoon. Last week, Speed51.com had their annual short track draft to hypothetically debate who the future stars of motorsports are. This week, we found one of our own rising stars by introducing Justin St. Louis of Vermont as the newest member of our writing team. Justin will cover selected ACT Late Model races and some other touring events for Speed51.com this season when he is not busy as a driver racing his Junkyard Warrior car at Thunder Road Speedbowl. Gary Drew knows where victory lane is at Oxford Plains Speedway. He’s been there over a dozen times in his career, including for a win in the 2001 Oxford 250. So the Pro Stock driver had no trouble knowing where to find his trophy Saturday night after winning the season opening 50 lap Pro Stock (Super Late Model) event. Drew held off Jeff White and Bill Whorff, Jr. at the finish. There were 21 Pro Stocks that started the feature event. coastal Maine track has been consistently winning races in the Pro Series (Super Late Model) class there since moving up to the division in 2001. The June 3rd Friday night True Value Modified Racing Series event at Lee USA Speedway will feature some good racing for a great cause. The race will benefit the Make A Wish Foundation and 40 families from the Make a Wish foundation will be on hand to see racing up close, meet drivers and enjoy the evening from the track’s VIP tower. Hot air balloon rides will be available for $5 each as well, with proceeds going to the Make A Wish foundation. Volunteers will pass the helmet through the stands for donations to the special cause during the night’s activities. This coming weekend, the True Value Modifieds will take on the Monadnock Speedway (NH) for their second race of the season. The Saturday night show is scheduled to start with heat races at 6:00pm. Last month, a feature on Speed51.com (click here for more) suggested that Corey Williams might be ready for a breakthrough this season. Well, so far the IBG PASS Pro Stocker might be making us look good by making that prediction prove true. Williams was pretty busy last weekend. He entered Saturday night’s Pro Stock feature at Oxford Plains Speedway (ME) and took home a finish of seventh in their 50 alp feature, then he towed down to Thompson for the PASS event. In Sunday’s 150 lap race there, he started on the outside of the front row and went on to lead the opening laps. The young driver held on to finish fourth in the feature and posted the best showing of his career to date. Up in Maine, Unity Raceway, Oxford Plains Speedway and Beech Ridge all got their features in. Waterford Speedbowl (CT) stopped their streak of rainouts by getting their action going for the first time in nearly a month. Tom Fox captured the SK Modified victory there. Thunder Road Speedbowl (VT) finally got their “Class Day” season opener and ACT race underway after a four hour rain delay. Click here for more on the ACT race. And Seekonk Speedway stayed dry long enough for a full card of racing after three weeks of being washed out. Vinnie Annarummo won that track’s 35-lap Pro Stock feature event.